John D. Shearer, a leading Canadian gemologist and decorative arts dealer and collector, first began collecting Lalique glass in Toronto almost 30 years ago. His first purchase was an opalescent Bacchantes vase for which he bid against a room full of dealers at a Toronto auction. He paid $750.00. Since then, John D. Shearer has bought and sold Lalique glass and jewellery to major collectors and dealers around the world. 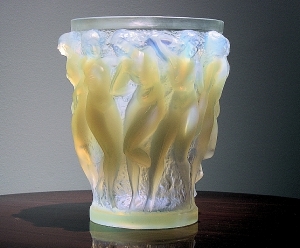 John D. Shearer is one of the foremost collectors of Lalique in North America. Because of his love of Lalique, John conceived of this web site for serious Lalique collectors and devotees. If you have Lalique you would like to sell, please contact us here on our site. John D. Shearer pays top international prices for Lalique.